Mustang sales, just nine months into this year, are their highest since 2007. After rising just 1.8% in the 1st half of the year, Ford Motor Co.'s U.S. sales jumped 11% in the 3rd quarter. Here's how Ford's average transaction prices stack up against segment averages. DETROIT -- Ford Motor Co. sold nearly 88,000 more vehicles to U.S. buyers in the first nine months of this year than at the same point last year. More than 40 percent of those incremental sales were Mustangs. Redesigned about the same time as the F-150, the Mustang hasn't received nearly as much attention from investors and analysts because its volumes and profits are lower. But while F-series sales are roughly flat from a year ago, Mustang sales have soared 61 percent to their highest total since 2007 -- just nine months into the year. The Mustang's surge includes big gains in markets such as Southern California, where the Detroit 3 have fared poorly in recent years. Ford says 51 percent of Mustang buyers are new to the automaker. "Twenty-four- to 32-year-olds are buying that car and putting Ford on their shopping list," said Doug Davis, general manager of Kearny Pearson Ford in San Diego. "Before, they weren't even considering Ford." That sort of shift is why Ford CEO Mark Fields has described 2015 as a "breakthrough year" for the automaker. Redoing the Mustang, F-150 and several other important nameplates cut into earnings last year and in the first half of 2015. But now that dealer lots finally are getting stocked up with those updated vehicles, analysts are looking for Ford to show big improvement. Coming off a string of relatively problem-free product launches, Ford also is enjoying strong transaction prices and improved customer perception of its Blue Oval brand -- positives that have overshadowed weaker growth in China and trouble in Russia and South America. It has avoided the scandals that recently embroiled a number of its competitors, and while Fiat Chrysler Automobiles keeps trying to force a tie-up with General Motors, Ford is free of such distractions. Ford's third-quarter financial results, scheduled to be released Tuesday, Oct. 27, are the first chance for Fields to deliver on heightened expectations for the automaker. Wall Street projects Ford will double its operating earnings in the third and fourth quarters from its year-ago results. In the second half of 2014, Ford posted after-tax operating income of $1.98 billion, though special items reduced net income to $887 million. Analysts are forecasting Ford to post full-year results, excluding any special items, of about $6.7 billion this year and $7.7 billion in 2016. That compares with $4.6 billion in 2014. Ford says it's on track to beat last year's operating margins of 3.9 percent globally and 8.4 percent in North America. The third quarter already looks like a major step forward for Ford in the U.S., where sales rose 11 percent vs. a 6.2 percent gain for the industry overall. Ford's U.S. sales increased just 1.8 percent in the first half of the year. "North America's going to be the key factor in a strong-growth third quarter," said Efraim Levy, an equity analyst with S&P Capital IQ. In addition to big jumps in sales for the Mustang and Explorer, completion of the expensive F-150 changeover means Ford now gets to reap the profits generated by higher transaction prices for the pickup. F-150 production, which declined 27 percent in the first half of the year, rose 33 percent in the third quarter, according to the Automotive News Data Center. "Now you get a full pace of sales combined with a reduction of the costs that they incurred last year in advance and during the ramp-up," Levy said. Ford's total North American production rose 14 percent in the quarter, compared with a 2.7 percent gain in the first half. But Brian Johnson, an analyst with Barclays Capital, thinks earnings still could fall short of estimates. "It's possible that expectations may have gotten too far ahead of themselves," Johnson wrote in a report this month. "While we expect a strong quarter from Ford North America, we think estimates may be too high." Outside North America, Ford's outlook is improving, but there are plenty of obstacles. It is getting closer to becoming profitable again in Europe, but its prospects in China are being hampered by a slowdown in the growth of that country's car market. Ford sales in China fell about 4 percent in the third quarter and are down 1 percent this year through September. This month, the company said it would spend $1.8 billion to introduce more high-tech features, hybrid cars and plug-in vehicles in China. It's building a test track there, as well. "With this investment in research and development, the next generation of Ford vehicles will be completely designed around our customers," Fields, who has spent significant time in China since becoming CEO 16 months ago, said in a statement. Jim Farley, who heads Ford of Europe, told Automotive News Europe last month that the company is nearing full-year profitability, despite serious issues in Russia, though he wouldn't reveal a target date. Farley said Ford has been helped by customers loading their vehicles with pricy options. "People are buying much nicer Fords, and that is really flowing into the bottom line in a way we didn't anticipate," Farley said last month at a Deutsche Bank conference. "The underlying Europe business continues to get healthier and healthier." But the vast majority of Ford's profits come from the U.S., where the automaker is enjoying a potent combination of rising prices and increasing sales. That surge, on top of a 23 percent sales gain for the month, translates to a revenue increase of $1.8 billion, or 31 percent. The higher pricing is a legacy of Fields' predecessor, Alan Mulally, who worked to elevate Ford slightly above other mainstream competitors with innovative features and in-vehicle technology. "Ford clearly, coming out of the recession, was able to take advantage of all the investing they did during the downturn," said Stephen Brown, an analyst with Fitch Ratings, which has rated Ford's outlook as positive since mid-2014. "GM has been closing that gap, but Ford is still a little bit ahead." Sales are up significantly in the Ford brand's most profitable segments, with utility vehicles rising 16 percent in the third quarter -- including a 25 percent gain for the highly profitable, newly freshened Explorer -- and other light trucks up 14 percent. It introduced the $54,000 Explorer Platinum during the quarter and has a $60,000-and-up Limited version of the F-150 on the way. But sales of cars such as the Fusion and Focus have dropped, and Escape sales were negative in the first eight months of the year, until a big September reversed that. Dealers are eagerly awaiting freshened versions of the Fusion and Escape coming next year. The two nameplates combine to account for about a quarter of the brand's sales. "It's really important that we have Escape and Fusion hit the ball out of the park with regard to quality and a great launch," said Vince Pavone, dealer principal at Lakeview Ford-Lincoln in Battle Creek, Mich.
Lincoln sales rose 15 percent in the quarter, though Ford still has plenty of work ahead for its luxury brand. Ford's willingness to sacrifice some market share as it revamped its lineup and focused on setting itself up for longer-term success showed more discipline than it had historically, said Karl Brauer, KBB's senior director of insights. "They're getting better at looking at the long game and not playing the quarterly numbers game as much," Brauer said. "You're seeing that pay off as the product has a nice cadence, their pricing discipline's pretty solid and they've got technology prepping them for the future." The relatively smooth launches of the Mustang and F-150 represent marked improvement from the botched product introductions of several years ago. Joe Hinrichs, Ford's president of the Americas, appears to have resolved many of the issues that were leading to delays and poor quality. Ford's biggest problem with the F-150 was a shortage of frames from a supplier in Kentucky that forced it to eliminate some overtime production shifts. Ford tapped a second supplier, Tower International, to ease the backlog starting this month, and dealers said the shortage never noticeably cut into the F-150 deliveries they received. "On the F-150, there was so much concern that with the aluminum body and some of the other new technology on that vehicle that there were going to be issues," Pavone said. "But it's been smooth, and we've found that the customer has embraced the vehicle much quicker and more enthusiastically than some of the other launches." 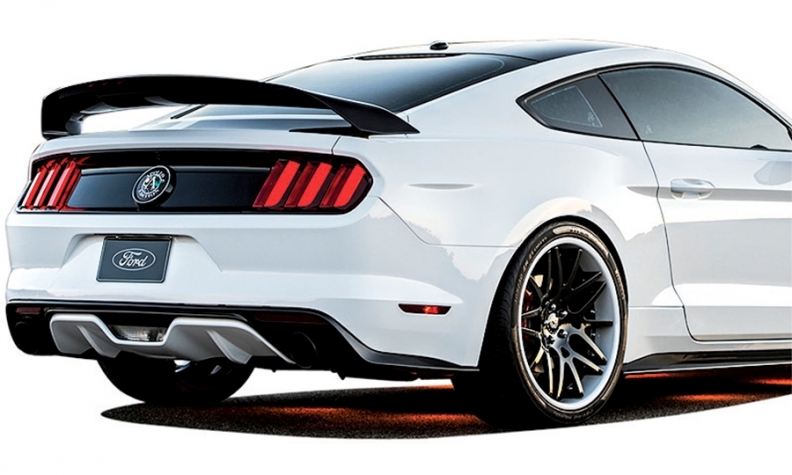 In California, Mustang sales are up 114 percent this year through September. The most popular engine choice in California is the 2.3-liter, four-cylinder EcoBoost option. Davis, the San Diego dealership manager, said the availability of a four-cylinder has made the Mustang appeal to a broader range of shoppers. Sales at his store jumped to between 30 and 45 Mustangs a month from 12 to 15 before the new Mustang came out last fall, though low inventory has hampered the dealership in recent months. "I think Ford underestimated the popularity that it would have," Davis said. "The customers that have the car, they're really enthused about it -- what the performance is and what the fuel economy is." Though the Mustang isn't Ford's top-selling or most profitable nameplate, Fields can point to the car's growth as a proof point for Ford's product strategy, and it helps rebuild the aura of the Blue Oval. That's a big reason why this generation of the car is sold globally, including in more than 100 markets where Mustangs had been difficult or impossible to buy before. Worldwide, Mustang sales rose 56 percent in the first half of the year, Ford said, citing registration data from IHS Automotive. "People overseas know the car instantly. It has a cachet to it," said Erich Merkle, Ford's chief U.S. sales analyst. "It's a halo car. It's our calling card."